Researchers provide a blueprint for a tiny device that can control the direction of light. 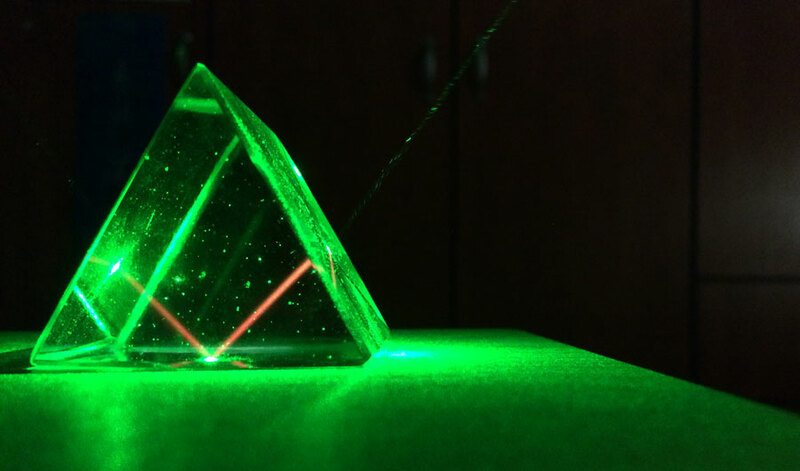 Internal refraction of a beam of laser light inside a prism. (Inside Science) -- Researchers have come up with a blueprint for a small and tunable device that can control the flow of light. Because it’s much tinier than existing technology, the invention could help shrink optical equipment to the nanoscale, and even enable superfast computers that run on photons instead of electrons. The results will be published in the journal Physical Review Letters. Electric diodes are devices that only allow electric current to pass in one direction. Similarly, optical diodes only allow light to pass in a single direction, and they play an integral part in some devices. For instance, high-end lasers used for scientific research, medical applications and even the military all require optical diodes to protect the lasers from being damaged by their own beams. While the function of many components of electronics, including resistors, inductors and capacitors, are relatively easy to duplicate in optical systems, for a diode "it is very difficult," said Hamidreza Ramezani, a physicist at the University of Texas Rio Grande Valley. One reason why, he said, is because photons have virtually zero mass, which makes them much more difficult to manipulate in certain ways. Ramezani and his colleagues from the University of California, Berkeley have now proposed a new way to make small optical diodes using rubidium atoms trapped inside a small, partitioned vacuum capsule. Their device would use a laser, which would be split into two beams that enter the device from both ends and create a standing wave. The wave would affect an optical property of the rubidium atoms called the index of refraction. Since the index of refraction of a material can help determine the amount of light that passes through, the optical diode would be able to control the flow of light. In a sense, an optical diode operates like a true one-way mirror. Unlike an ordinary one-way mirror, which only creates the illusion of one-way transmission of light, an optical diode -- sometimes called an optical isolator -- actually controls the flow of light entering from a certain direction. "There are actually many ways to build these isolators, and you can buy them, but most of them use magnets and they tend to be quite bulky," said Andrea Alù, a computer engineer from the University of Texas at Austin who was not involved in the research. The new blueprint offers a path to make the diode small and to do away with magnets. It is part of a push to make diodes more versatile for future, perhaps nanoscale, applications, by looking for ways to integrate them into photonic devices directly -- so-called "on-chip" solutions -- instead of relying on clunky attachments. “[In] optics in general, there is a strong push for miniaturization of components. If we can have everything 'on-chip,' it'll help us do all kinds of manipulations of light," said Alù. Photonics has already revolutionized some areas of technology -- optical fibers are one example. In 2012, a team of Japanese scientists sent a whopping one petabit of data per second down a single optical fiber over a distance of 50 kilometers -- that’s enough bandwidth to stream 4K HD video to 40 million TVs. Without drawbacks from resistance, interference, or a narrow bandwidth, photons are mind-blowingly more efficient than electrons as carriers of digital information. Today, fiber optic cables have replaced copper wires as the go-to option for long distance data transfer. Future applications could include optical computing -- the elusive white whale of photonics research. It holds the promise of ultrafast, energy-efficient devices and could revive the recently stagnated growth in computing power, rejuvenating the relationship between cost and computing power illustrated by Moore's law.